Uh-oh…..watch out for the Boo……….it’s addictive……….. Okay, so Shirley Weber and I (also The Rice Czar, can’t leave Mr. Bill out) were at knitting last Sunday. Shirley was asking about a pattern for some scarf yarn she wants to knit up. So I told her about this pattern and this yarn I bought at Purls in Tucson (when I was ummmmmm……….chaperoning the HOSA students at their state competition/convention. The male chaperone took over so I could have a break). It is Bamboo by Southwest Trading Company. It’s one of those things that one of the ladies in the store was wearing, I overheard her telling another knitter that every time they got this yarn in Boom! they sold out. She had this scarf on in this colorway. So, being of weak constitution, of course I bought it. And another skein, different colorway. When I got home I cast on, and OMG, watch out, it is super addictive. Maybe moreso than the Ewe. 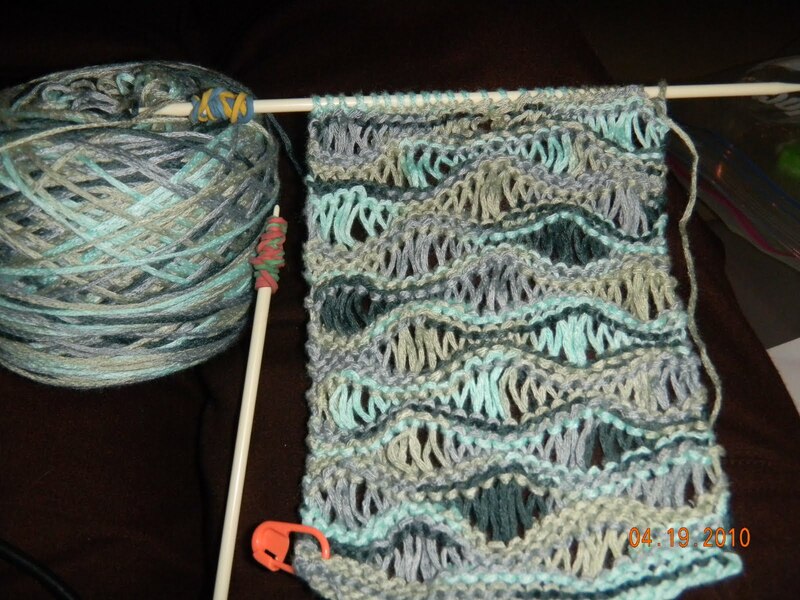 Any kind bamboo yarn would work, you need a yarn with a soft, drapey-hand. Louisa did a scarf like this with bigger yarn. You can see it here, just scroll down to Jan. 16.I will bring it on Sunday. I am knitting it on size 5 needles. It is listed as a size 3 yarn which is DK or lite worsted, I think. Watch out for this scarf, it will beckon to you………………..must…………………cast……….on………………………. Hello all, this is such an easy, no brainer, carry with you pattern. This isn't one of those super concentrated you have to be alone to knit patterns. It lends itself to being social. Shirley A had a good idea to make it wider for a shawl. There is a shawl version of this in either the new Knitters or Interweave Knits- I saw it tingetings yesterday, it was gorgeous.